As part of its mission to protect natural lands and preserve the environment for all people, Earth Day Network developed The Canopy Project. Rather than focusing on large scale forestry, The Canopy Project plants trees that help communities – especially the world’s impoverished communities – sustain themselves and their local economies. Trees reverse the impacts of land degradation and provide food, energy and income, helping communities to achieve long-term economic and environmental sustainability. Trees also filter the air and help stave off the effects of climate change. With the reality of increasingly unpredictable weather patterns and more frequent and violent storms and floods, tree cover to prevent devastating soil erosion has never been more important. That’s why Earth Day Network made a commitment to plant 10 million trees over the next five years in impoverished areas of the world, and a billion trees worldwide in honor of the 50th anniversary of Earth Day. Over the past three years, The Canopy Project, has planted over 1.5 million trees in 18 countries. In the US, projects to restore urban canopies have been completed in New York, San Francisco, Los Angeles, St. Louis, Atlanta, Baltimore, Cleveland, Flint, and Chicago. In Haiti alone, where earthquakes caused landslides on deforested hillsides, leading to horrific devastation, Earth Day Network planted 500,000 trees. And in three high-poverty districts in central Uganda, we planted 350,000 trees to provide local farmers with food, fuel, fencing, and soil stability. Our tree plantings are supported by sponsors and individual donations and carried out in partnership with nonprofit tree planting organizations throughout the world. We work in partnership with the United Nations Environment Programme’s Billion Trees Campaign. 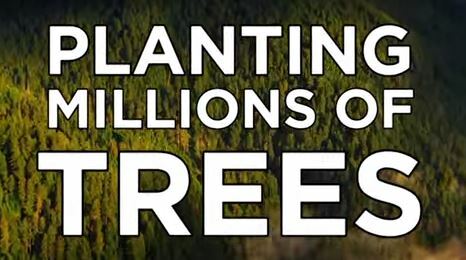 Each tree planted is counted toward A Billion Acts of Green. Thanks to generous donors the goal of planting 51,000 fruit trees in Lalitpur, India is within reach! Earth Day Network is working with local partners, women’s self help groups, self government (panchayat) women leaders to help with the planting. Why did we locate this planting in Lalitpur? This district in the state of Uttar Pradesh is one of most underdeveloped districts of India. Saharia tribals form the majority of the population and most are poor and impoverished. According to reports, many resort to eating rotis (flat-bread) made of wild grass due to poverty and hunger. The area is stressed by drought, too, and in 2015 it was declared the worst hit in India. The fruit trees we planted are guava (Psibium guajava), gooseberry (Phyllanthus emblica), lemon (Citrus limon), Wood Apple (Aegle marmelos), Jackfruit (Artocarpus Heterophyllus), Custard Apple (Annona reticulapa), Moringa (Moringa oleifera) and Pomegranate (Punica granatum). The trees planted today will bear fruit in about 4 years. Consumption of the fruit by families in Lalitpur will improve the health of children and adults, while profits from sale of extra produce is expected to bring financial benefits of up to 15 million Indian rupees (approximately $234,239 USD) over a five year period to 1,200 families! Who is Visiting Us Now? Waarom Zonnepanelen Op Jouw Dak Leggen? MVO Manager Van Het Jaar 2019: Wie Gaat De MVO Bokaal 2019 Winnen?